While out to dinner recently, a friend ordered chocolate fondue for dessert. And when the platter arrived grouped with colorful blocks of fresh strawberries, green apples, bananas, pound cake, brownies, and marshmallows with a pot of chocolate in the center and silver skewers strewn around, it brought smiles to our faces! While out to dinner recently, a friend ordered chocolate fondue for dessert. And when the platter arrived grouped with colorful blocks of fresh strawberries, green apples, bananas, pound cake, brownies, and marshmallows with a pot of chocolate in the center and silver skewers strewn around, it brought smiles to our faces! It looked like fun on a plate. I had almost forgotten what fondue looked like. The last time I had it was in college. It occurred to me that if this type of dessert could bring so much excitement to me as a thirty-something-year-old adult, just think of what it would do for a toddler! Much like adults, kids eat with their eyes first, and they too can appreciate a nice presentation of colorful foods on a platter. Kids love getting involved with their food, giving things a good "dip". And for better or for worse, you just know they're going to have a hay-day using those skewers! The next day, I decided to surprise my family with a fondue dessert party on Tuesday night. I announced that anyone who ate a good dinner (subjectivity allowed) could look forward to an exciting dessert party. Everyone--including our sometimes finicky toddler--polished off their dinner. For me, any night I can get a nutritious meal on the table is a feat. The thought of also making dessert never usually enters my mind, so I needed a fondue recipe that I could make in 5-10 minutes or less; something as simple as chopping fresh fruit and melting some chocolate chips in the microwave. 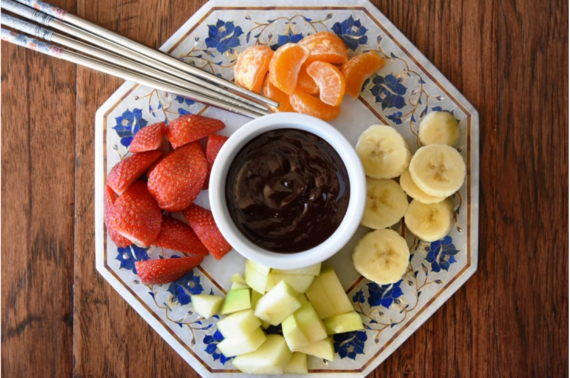 Below is a simple chocolate fondue recipe that is even perfect for a weeknight. If you try it on your family, I hope you all have as much fun eating it as we did! Even our infant participated in our dessert party. He enjoyed tiny bites of the fresh fruit (sans chocolate) while dancing in his highchair! Place the chocolate chips and milk in a small, microwavable bowl. Microwave for about 1 minute. (Take care not to microwave much longer or the chocolate will burn.) Briskly stir the chocolate until melted and smooth. Serve the chocolate dipping sauce in a small bowl with fresh fruit and other accompaniments of choice around it. 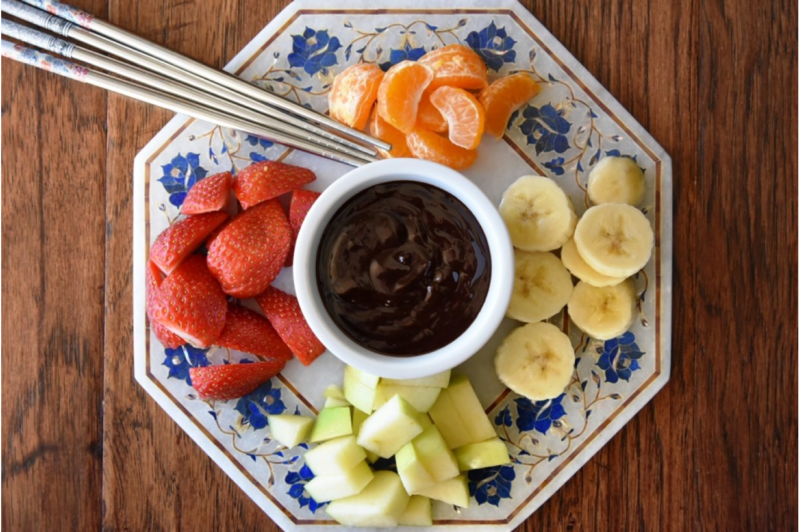 Use skewers, chopsticks, toothpicks, or a fork to "poke" the fresh fruit and "dip" it in the chocolate sauce. Enjoy! A version of this post first appeared on What a Good Eater!, a baby and toddler cookbook and website with wholesome, family-friendly recipes designed to promote a well-rounded eater right from the get-go. Join the newsletter, here, and follow for news on the book release!